Kevin Harvick return to victory lane for the first time this season with a very convincing showing on the road course at Sonoma Raceway. Harvick came to Sonoma, not having won in 20 races,which was last fall at Kansas, it was also Harvick’s first road course win since 2006 when he took the checkered flag at Watkins Glen. 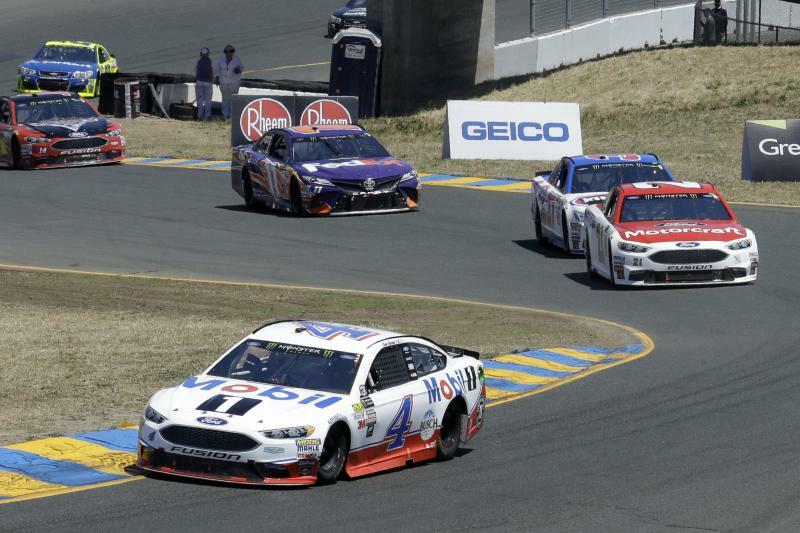 It was a banner day for Ford on Sunday afternoon, with SHR teammate Clint Bowyer aswell as fellow Ford driver Brad Keselowski finishing second and third respectively. This was Ford’s seventh victory of the season. Ford won eight Cup races last season, and seven came from Penske Ford drivers. This year, Ford has wins from Penske, Roush-Fenway Racing, The Wood Brothers and SHR. Martin Truex Jr. earned his series-leading 11th midrace victory, beating out A.J. Allmendinger in Stage 1.Martin Truex Jr. led 25 laps but suffered an engine failure and finished 37th.Jimmie Johnson overcame a number of cautions to earn his first stage win of the season in the second,adding some bonus points to the Chase bank. Kahne was in a hard wreck on the final lap of the race and wasn’t best pleased with fellow driver Kevin O’Connell, who was making his Cup debut.Kahne had this to say. Patrick, who started sixth and finished 10th, was involved in two wrecks that banged up her car,however she managed to salvage a solid finish.Alon Day became the first Israeli driver to start a Cup race. He finished 32nd out of 40.Next race well be on Saturday night at Daytona International Speedway.